The Keystone Hideout travel trailers for sale here at A&S RV Center are built to provide a high level of luxury without the added price tag. And with 20 different floorplans to pick from, finding the camper that fits all of the needs of your family will be easy. Let’s take a closer look in this Keystone Hideout travel trailer review and find out all that you can enjoy for less. 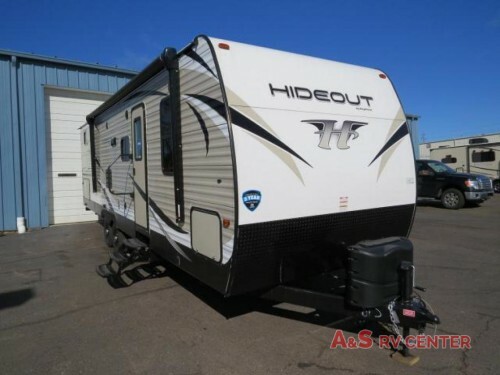 Check out our Keystone Hideout Travel Trailers! As we said earlier, the Keystone Hideout will come in 20 floorplans that you can get, so there is certain to be a size for your family. Get up to three slideouts and sleep anywhere from four to eight people for the perfect fit no matter how many you wish to bring along. 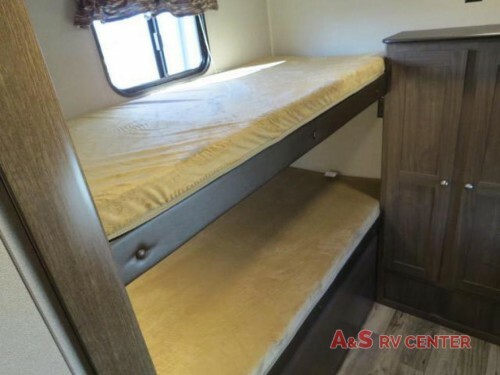 Plus with options of bunk beds, bunkhouses, convertible furniture, Murphy bed, and queen master bed complete with full strutted storage underneath, there will be endless combinations of sleeping solutions to fill exactly what you need. Bunkhouse floorplans make the perfect family RV. By keeping affordable luxury in mind, these Keystone travel trailers will have amazing amenities throughout the interior. As soon as you step into the main room, you will find a spacious living room and kitchen combo with everything you need for comfort including options of residential appliances, theater seating, recliners, an HD LED TV, and much more. And with a full bathroom with some even featuring a private entrance to the master bedroom or straight to the outside, you will feel right at home. You’ll love the luxury throughout the interior. These features will not only be located inside the Hideout travel trailers but will also be found outside. 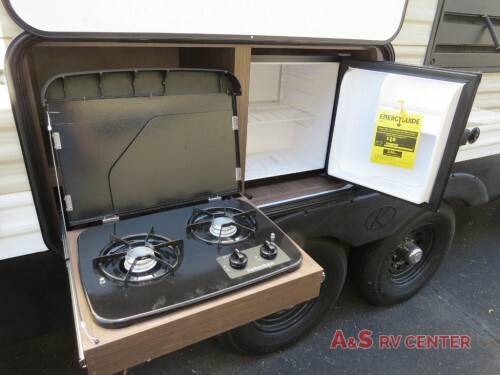 The oversized pass-thru storage compartment will make packing luggage and camping gear for the family a breeze, and with a lighted, adjustable power awning and optional exterior kitchen, you can spend more time outside relaxing in the shade or even making meals for the family. With exterior amenities like the outdoor kitchen, you’ll find even more items to enjoy. 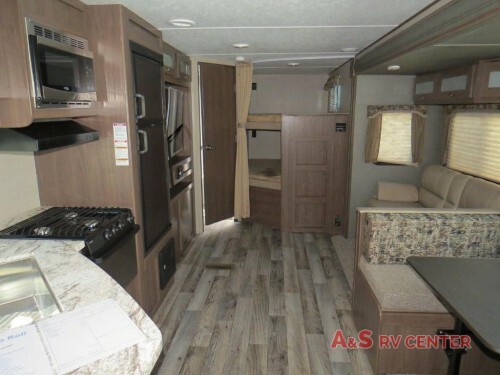 With prices starting at just $14,995, our Keystone Hideout travel trailers are some of the most affordable recreational vehicles while still featuring an excess of amenities. To find out even more about these RVs, feel free to contact us or come on by our locations today!